Wall set designed just for kitchens and dining rooms, with a couple matching tile floors. Batik Print Wall Hangings, Hot Date organized - requires Livin' Large. Veeeery upscale with restaurants and shops. 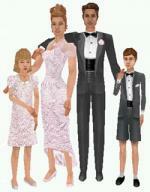 NOTE: Your sims might want to go out to a club afterward, like most museums the amusement is cerebral. Needs the Downtown Windows Pack, Livin Large and Hot Date. A new 4-pack of plate glass windows, great for Downtown shops. No exp packs necess. Note: pic shows 3 full wall windows side-by-side and one of each of the others. 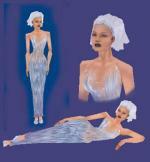 Snowqueen head/dress and meshes. Head mesh by Frilly Sims included for your convenience is also available at www.frillysims.com. Three puppy skins for Unleashed. 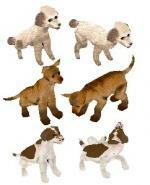 The poodle requires the pet pack simday download from The Sims Official Site at EA for the mesh. Challanger Starter: US Craftsman style has a furnished first floor and unfurnished "attic". Not much to spare at $19,962. Requires LL, and Hot Date. 5 BR/4 Bath Victorian Home. $37,031 Requires Livin'Large, HP and HD, my Black Shuttered Window and Bettyjoe's "BJ's Floral Victorian Set" Walls available on this site. I used a few plants from Vac. and Unleashed, but could be used without.